I didn't realize black kitties got passed over so often. Look at Ducky! 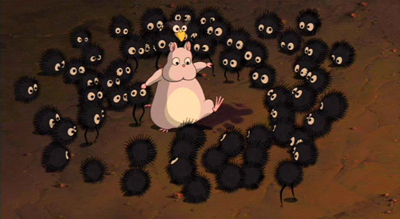 Doesn't Ducky look at lot like the Soot Sprites from My Neighbor Totoro and Spirited Away? Good luck finding a happy non-discriminatory (hee) home, Ducky! As an owner of a black cat I can tell you that he has crossed my path several times and we believe has canceled out any bad luck that was to come. My black cat is very loving, he always chooses to lay in the same room I am in. We have also found he is attracted to black things. For instance my husband's guitar amps, black bags, etc. He is always found laying on them. 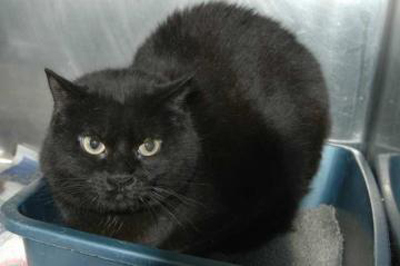 hope someone adopts this lovely black kitty! by the way, have you seen these yet? My black cat is also attracted to black things, such as a pile of freshly-laundered socks. We adopted her because she was black and we know they get passed over. The more I hear about it, the more I think I will always have a black cat from now on. Our black cat is the sweetest, chillest kitty I've ever met. :) If anything, he's brought us only good luck. Java is my black cat's name, and he is by far the best cat I have ever had, and I grew up on a farm of cats. Ducky, though, I will say, doesn't look all that happy and loving. I'm hoping it's just that he/she frowned at the time of the photograph. Awww - he does look like a soot sprite!